Hi friends... Welcome to AYESHA'S KITCHEN. How about a spicy, super moist cake with chicken?... A best tea time cake snack ever with handy ingredients. I made this cake with some leftover chicken, some grated carrot and egg. 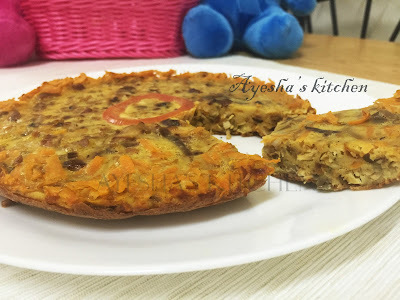 Try this spicy chicken cake at home and enjoy with a nice cup of tea. You can also substitute mushrooms or vegetables instead of chicken. Heat a pan and when hot add 1 tsp of coconut oil. Then add the shredded chicken pieces to it along with tomato sauce, pepper powder, garam masala powder and salt. Saute well on a low flame and keep it aside. Whisk the eggs well in a bowl. Mix cornflour and maida in milk, stir well. Add it to the egg mixture. Now add fried cashews ( chopped) or fried coconut slices ( chopped) to the egg mixture. Mix well again. Now finally add the shredded chicken fried pieces to it and stir well all together. Add chopped coriander leaves and check for salt. Now heat a non-stick round vessel and spread 1 tsp ghee evenly. Make the flame to medium-low once the mixture is poured. Close the lid and let it cook for 5 minutes. Now open the lid and decorate with carrot slices and again close the lid. Allow it to cook on medium flame for about 20 minutes. When done transfer to a plate and let it cool.